A logo of the new Samoa Airways. The Samoan government says its new airline will offer flights from Apia to Auckland, Brisbane and Sydney using one Boeing 737, according to local media reports. The airline, called Samoa Airways, is due to take off on November 12 2017 with a 737 leased from Icelandair, the Samoa Observer said. 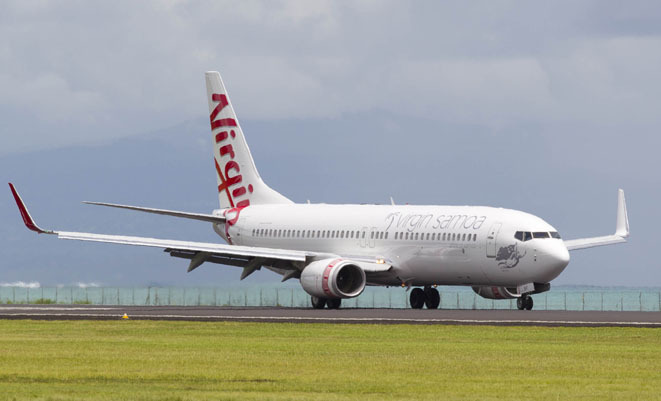 In May, the Samoan government announced it was terminating the Virgin Samoa joint-venture between Virgin Australia and the country that was first established in 2005. Media reports at the time said the decision to ditch the JV was due to concerns over high fares. A memorandum of understanding with Fiji Airways was signed in July to help establish Samoa Airways, with the current domestic carrier Polynesian Airlines to be part of the new venture. Prime Minister Tuilaepa Sailele Malielegaoi told the Samoa Observer on August 18 Fiji Airways would continue to focus on Fiji-Samoa flights, while Samoa Airways would focus on routes to New Zealand and Australia. Virgin Samoa, 49 per cent held by Virgin Australia, 49 per cent by the Samoan government and two per cent by Samoa- based tourism company Grey Investment Group, flies from the Samoan capital to Auckland Auckland, Brisbane and Sydney. The airline does not own any aircraft. Instead, Virgin Australia operates services on behalf of the joint-venture airline. However, one Boeing 737-800 has been painted in a special Virgin Samoa livery. A file image of a Virgin Australia Boeing 737-800 wearing Virgin Samoa titles. Recently, Virgin Australia signalled it intended to maintain services to Samoa after the JV winds up in November. The airline recently applied for and was granted traffic rights for 880 seats of capacity a week between Australia and Samoa from Australia’s International Air Services Commission (IASC). The application stated Virgin Australia planned to operate five flights a week between Australia and Samoa from November 13 2017 with Boeing 737-800s configured with 176 seats. The IASC also approved Virgin Australia’s request that the capacity was also able to be utilised by its wholly-owned low-cost carrier Tigerair Australia. Would have with a smaller aircraft -700 for starters! @ BRIAN WILKES, why a smaller aircraft ? Does Icelandair have any 737’s ? Or do you mean 757’s ? Icelandair fleet all 757/767’s I think. I don’t think Icelandair will have any new 737 max’s until 2018. I think this is a good move having previously stayed in Samoa; the prices even with one week stays were definitely going up. I also hope the aircraft is flown by national pilots. 737-800 with 170 seats. 162 economy & 8 business, but no flights to Brisbane, although the timetable shows aircraft at AKL for 24 hours Sun am to Mon am.